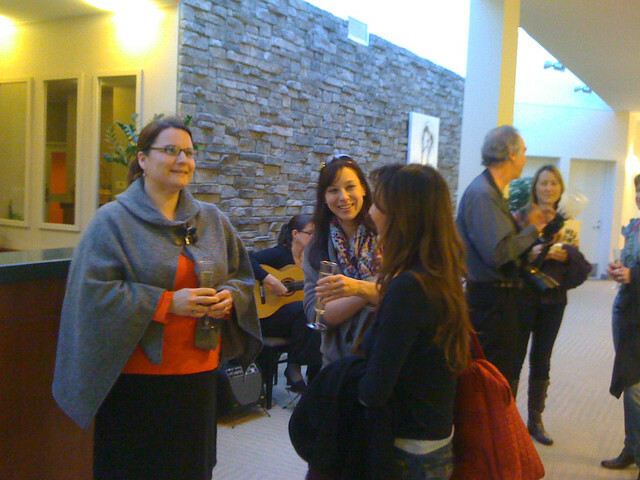 Media and event planners gather at a welcome reception for the Lenox Wedding Tour, which just wrapped its second year. As a former travel writer, being on the planning end was an experience unto itself. A project I’ve been involved with has just wrapped: an autumn showcase of wedding venues, lodging, and restaurants designed to promote the town where I hang my cool vintage hats. Naturally, I have thoughts to share. 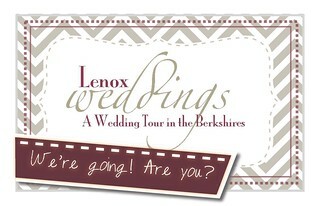 Lenox is in the heart of the Berkshire Mountains, and the Lenox Wedding Tour invites luxury and destination wedding planners and bridal media to experience and learn about Lenox and to meet purveyors of fine food, flowers, fashion, photography, transportation, party rentals, and more. I was asked to join the planning committee last year, and signed on as the de facto PR/media relations member. My role was to reach out to members of the media, including bloggers, who might want to attend the tour; to publicize it locally and among wedding media, and to tag team social media efforts with fellow PR prof Tara Consolati, who also designed the tour’s marketing materials and planned much of its marketing strategy. There were highlights when working on each of these aspects; sourcing media for the trip led to some great conversations and connections, which beyond being soul-fulfilling is one of the best ways to, in a phrase, get your story straight. The more I talked about the Lenox Wedding Tour with these dynamic, smart writers and producers, the more interesting nooks and crannies I found in the story. When talking to our local Berkshire media about the tour, Tara and I were able to share some of the work we were doing in the social media realm: we created Pinterest boards and web badges and participated in a Live Twitter Chat organized by Wedding Market News. Plus, it’s always gratifying to get to talk about social in a ‘mainstream’ forum. 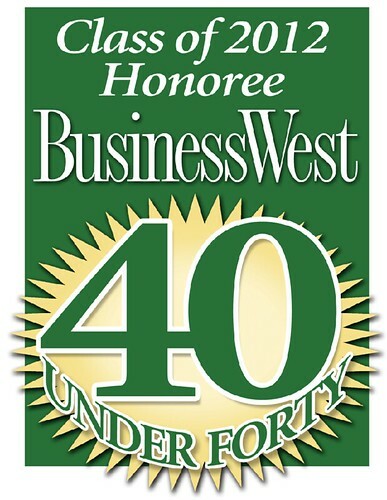 Seeing the word ‘Tweets’ in newsprint … I don’t know, there’s just something about it. Something in between Validation and Worlds Colliding. As the tour neared, I started to realize another interesting part of my involvement. I was a travel writer for several years and went on a lot of press trips – this time though, I was on the other end of things. Instead of being greeted by someone at the airport, I was the greeter — I took this role on wholeheartedly and made a homemade sign reminiscent of those at high school basketball games. Jeana was very gracious even when welcomed by someone with a penchant for scrapbook paper and markers (and when I had to borrow a dollar for the tolls), but in the future I’ll probably do the same thing the limo drivers who were standing next to me and use one of those newfangled computer machines to make my sign. Being on the planning side taught me some other, more substantial lessons about the press trip (also known as fam tour) model to add to those I learned as a writer, and also gave me an interesting perspective on the Lenox Wedding Tour itself. For example, it runs a bit larger than a usual press trip as it welcomes both event planners and media. The tour also includes a wedding showcase open to the public, so couples became a part of the mix as well. The high concentration of lodging options in one town makes managing the higher numbers of attendees doable, which I think adds weight to the notion of a press tour for small and niche communities. I also thought the tour made more resources to put a great story together readily available than the usual trip. In addition to members of the planning committee, the group was surrounded by wedding professionals throughout the four-day trip who could talk to them about local and industry trends, and the planned events and activities aren’t typical excursions. 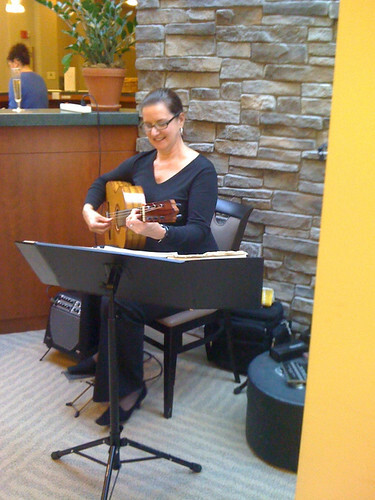 One of my favorite events was the welcome reception at Cranwell Spa, complete with mini-treatments for guests, champagne, desserts, and a Spanish guitarist. It was also held on my birthday, so I pretended the champagne, dessert, and music were all for me. 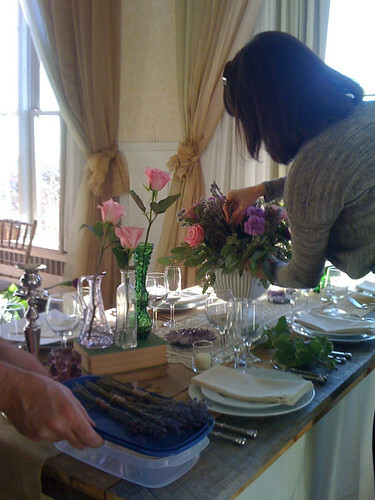 Relaxation came first, but later, guests were put to work: The Tablescape Design event challenged planners and media to set and decorate tables, and those settings were later used at the tour’s Dinner with the Designers at Cranwell Resort. 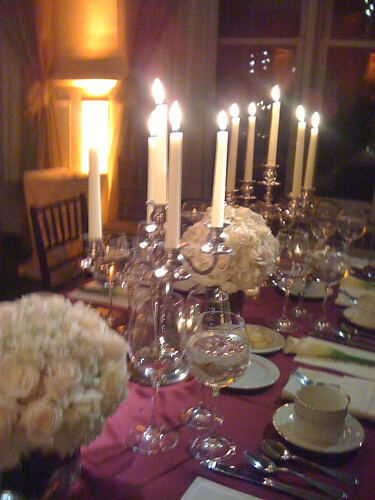 As I watched from the front of the room — I was on the Twitter Chat panel at the same time tour attendees were frantically choosing flowers and searching for matching glassware — I mused that it was a different, but very replicable activity that was dynamic, visual, and helpful for media and planners alike. For planners, there was inspiration and a keyhole view at what trends other planners from across the country might be seeing on their own reception tables. For writers, it served as a sort of assignment within an assignment; I felt as though an entire article could be crafted from the tablescape challenge alone. Designers put the finishing touches on their tables … later, they were ready for diners. 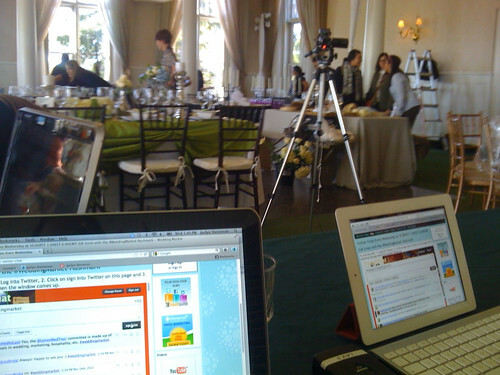 The view from the TwitterChat table during the Tablescape Design Challenge. As the tour moved along, those great conversations that started with publicity efforts continued. Attendees had great feedback on the town and its offerings, as well as great ideas. 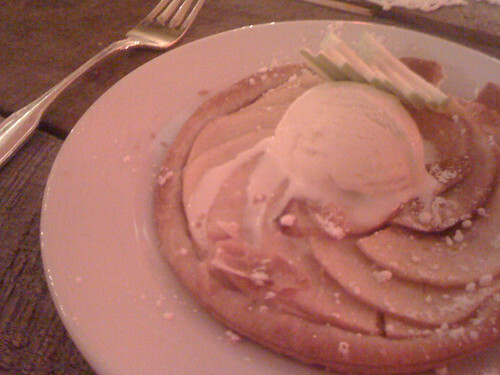 In the end, that was the most gratifying piece of the experience; that, and the apple tart at the farewell dinner. Once a foodie, always a foodie. Enjoyed this…sounds like mixing business with pleasure is right up your alley! I got to work with some really smart people. That’s that best reward!